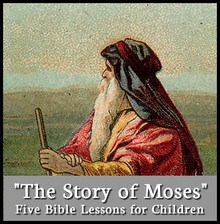 This page contains some simple songs you can use along with our lesson plans about Moses. Each of these is set to a familiar tune and can be sung without musical accompaniment. These are helpful for preschool Sunday School or other context with younger kids. You can [print_link] these songs directly from this page, or download the print-friendly PDF file. Keep the Sabbath holy, that’s God’s special day, HEY! No false tales, no envy this is God’s great deal, HEY! To the tune of “Rock-a-Bye Baby”. To the tune “Louie, Louie”. God wants you to share it. God wants you to share it. Yes Lord, yes we will. Here a Yes, There a Yes, Everywhere a Yes! Yes! Thank you for sharing what God has laid upon your heart. Thank you for sharing. I will definitely use this for my Bible Explorer Kids. I will comeback for kids feedback. thanks for so many ideas that you’ve shared may the Lord God Bless you more with amazing ideas to share..
Tony Kummer (Editor) reviewed & updated this page on : November 11, 2010 at 12:15 pm. All our content is peer reviewed by our readers, simply leave a comment on any post suggest an update.